Between work and my Xbox 360, I've had little time to work on Foodry. I've added a few little things to improve the usability and to make it a bit more interesting in general. First, I've added a Top Reviewers list to the home page. Looks like Aaron has taken a huge lead with 31 reviews. I've also improved the city pages a bit. Where they were just a search results page, now they are more of a summary page, with a tag cloud and most viewed restaurants list. Future features will include top reviewed restaurants, top reviewers for the city, and a list of nearby cities. Take a look at a few: Seattle, WA, Cleveland Heights, OH, and, one of the most popular, thanks to Aaron's reviews, Stevensville, MI. Not quite as recently, but not mentioned on this blog, I added the ability to mark other users as friends, so you can visit your profile and surf on over to a list of their reviews. Future improvements will include being able to filter, search, and combine your friend's reviews into more useful lists, as well as being able to track friend's reviews via RSS feeds. So, I'm home alone for Christmas, since the wife has to work. It's OK, though, since I have my Xbox 360 to keep me company, right? Well, a couple hours into hunting down necromancers in Oblivion, the 360 makes an awful buzzing sound that doesn't stop. The game's still playable, though, so I save it and shut the Xbox off and let it cool down for a few minutes. Turning it back on, I hear the optical drive make some unusual noises: "Uhhn, chirp, chirp. Uhhn, chirp, chirp. Uhhn, chirp, chirp. Buzzzzzz." Instead of going to the starting screens of Oblivion, it drops me off at the dashboard, where, in the disc status area, it says "Reading" and then "Unplayable Disc". Taking the disc out, it appears to be spotless, but I wipe it off anyway and get the same result upon reloading it. I then try Tiger Woods 2007 and NHL 2007, and get the same result. I then try a DVD: Charmed, Season 1. Same results. I think my optical drive is not feeling so well. The rest of the system seems fine, in that I can connect to Xbox Live with no issues and play the Xbox Arcade games that are on the hard drive with no problem. I guess I get to call Customer Support tomorrow morning. How fun. Update: 12/26 9:00AM - I just got off the phone with the Xbox support folks. It was surprisingly easy. After telling the annoyingly casual-sounding robot he couldn't help me (I half expected him to call me "dude"), I was immediately transfered to a nice woman named Inez. I told her my problem, she took my contact information, and we ran through some basic troubleshooting. I unplugged the cables and plugged them back in and still had the problem. I removed the hard drive and still had the problem. That was about it. After that, she set up a repair order and is sending me a shipping box, so it shouldn't cost me a cent. I should have it back within 14 days, though I'm not sure if that starts now or when they receive it. It's the latter, I'm sure. Xbox 360 warranty to one year, instead of the former paltry 90 days. 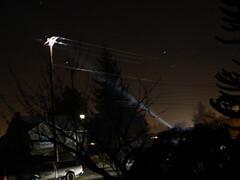 Our power was out for about 53 hours after the wind storm. Here are some photos. It was cold, but at least we have a gas fireplace, so we huddled around it and kept as warm as we could. From this winter's trades it already looks like the Mariners are throwing in the towel for a winning season in 2007. Time for a regime change. 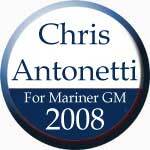 Chris Antonetti for Mariners General Manager in 2008.